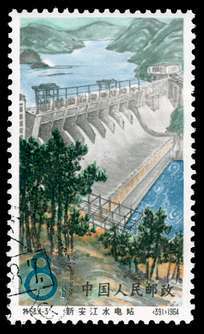 Scott #489, 1960 10f slate green Crossing Chinsha River. NH Superb. 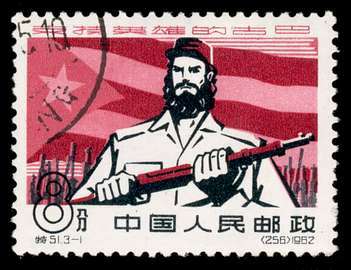 Scott #615, 1962 8f carmine, rose and black Cuban Soldier and Flag. Used Superb. Scott #728, 1963 Mount of Stalagmites. Used VF. Scott #732-6, 1963 Games of the Newly Emerging Forces. Used VF. Scott #808, 1964 20f Hsin An Kiang Dam. Used VF. 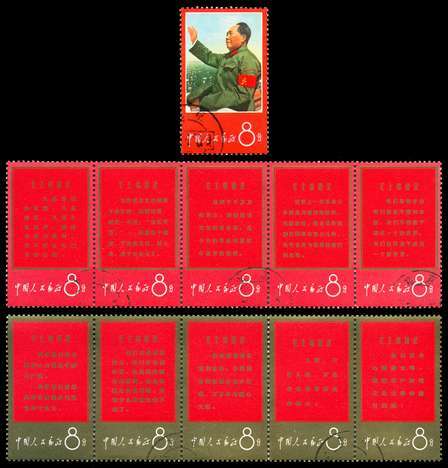 Scott #938-948, 1967 8f multicolored Mao and Thoughts of Mao. Used VF with the most-desired type of postmarks (neat, matching CTO, with perfect gum). 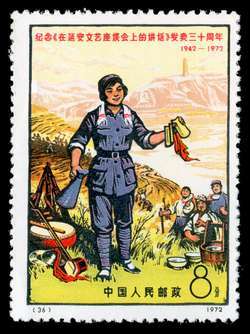 #938 is the Mao single, as issued. 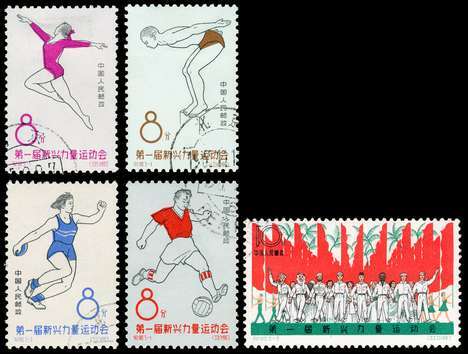 #939-948 are in two 5-strips, but have been carefully folded between the stamps (as are most), thus valued as singles instead of as strips. Very fresh and bright, without any tarnishing, or bends, or any quality problems. Scott 2019 value as singles is $850 (the value as the one single plus two strips -- which is what these look like -- is $1425)! A beautiful complete set! 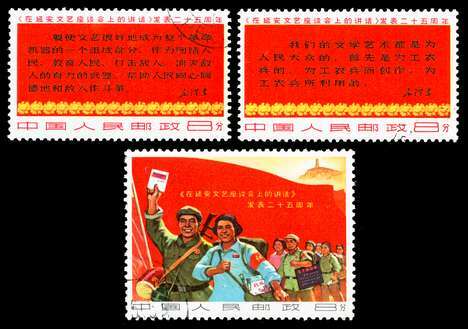 Scott #967, 1967-1968 4f multicolored Mao Poem: "The Long March". Used VF with the most-desired type of postmark (neat CTO, with perfect gum). Very fresh and bright; without any bends or quality problems. Scarce so nice! Scott 2019 value $90. 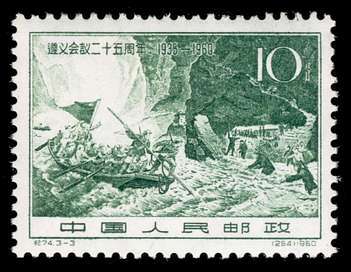 Scott #968, 1967-1968 4f multicolored Mao Poem: "Liupanshan". Used VF with the most-desired type of postmark (neat CTO, with perfect gum). Very fresh and bright; without any bends or quality problems. Scarce so nice! Scott 2019 value $30. 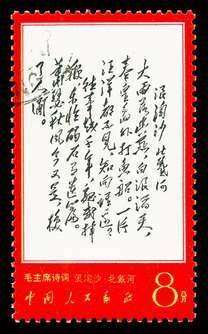 Scott #971, 1967-1968 8f multicolored Mao Poem: "Snow". Used VF with the most-desired type of postmark (neat CTO, with perfect gum). Very fresh and bright; without any bends or quality problems. Scarce so nice! Scott 2019 value $60. 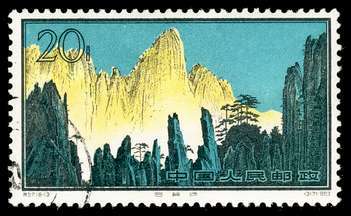 Scott #972, 1967-1968 8f multicolored Mao Poem: "Lushan Pass". Used VF with the most-desired type of postmark (neat CTO, with perfect gum). Very fresh and bright; without any bends or quality problems. Scarce so nice! Scott 2019 value $60. 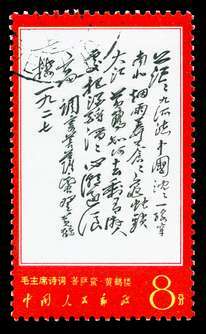 Scott #974, 1967-1968 8f multicolored Mao Poem: "Peitaiho". Used VF with the most-desired type of postmark (neat CTO, with perfect gum). Very fresh and bright; without any bends or quality problems. Scarce so nice! The key value of the set! Scott 2019 value $225. 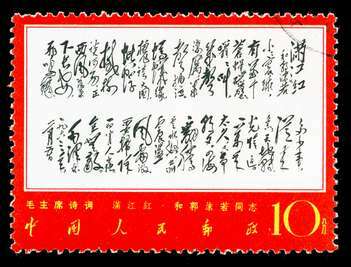 Scott #976, 1967-1968 8f multicolored Mao Poem: "The Yellow Crane Pavilion". Used VF with the most-desired type of postmark (neat CTO, with perfect gum). Very fresh and bright; without any bends or quality problems. Scarce so nice! Scott 2019 value $140. Scott #977, 1967-1968 8f multicolored Mao Poem: "Swimming". Used VF centered with the most-desired type of postmark (neat CTO, with perfect gum). Very fresh and bright; but with very tiny, hidden, tear between two perf teeth on left side. Otherwise without any bends or quality problems. Seldom offered so inexpensively! Scott 2019 value $145. 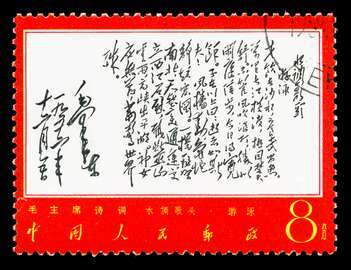 Scott #978, 1967-1968 10f multicolored Mao Poem: "Reply to Comrade Kuo Mo-jo". Used VF with the most-desired type of postmark (neat CTO, with perfect gum). Very fresh and bright; without any bends or quality problems. Scarce so nice! Scott 2019 value $30. 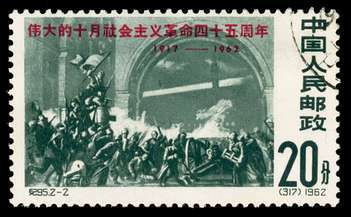 Scott #992-6, 1968 8f multicolored Mao Statements on Cultural Revolution. Used VF with the most-desired type of postmarks (neat, matching CTO, with perfect gum). #992-6 is in a 5-strip, but have been carefully folded between the stamps (as are most), thus valued as singles instead of as strips. Very fresh and bright, without any bends or any quality problems. Scott 2019 value as singles is $1250 (the value as a strip -- which is what this looks like -- is $2100)! A beautiful complete set! Scott #1087, 1972 8f multicolored Outdoor Performance. NH F-VF NGAI.